Bought on release ($26) and cellared well. Light ruby in color, clear and bright. The nose is nice earthy with cherries. Hints of green tobacco drying in a barn. On the palate, black cherries and minerals with a nice, slightly bitter streak. This is at peak now and I would drink in the next few years. Complex. Food friendly. Nice showing. Drinking well right now. Not yet at peak but I don't know how much better it will get. Purple in color. Wonderful nose of black cherries, green tobacco, cigar box and leather. On the palate, this is tightly layered. It opens in the glass. Black cherries, leather and earth. Good balance. Not a huge wine, but not shy either. Goes well with food. Outstanding wine. Some of the older standards of California wine get short shifted by the new comers. 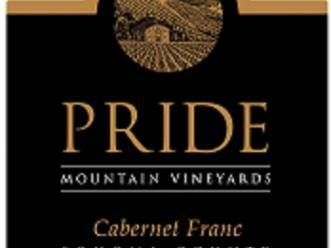 Pride is one of those whose wines stand the test of time and over a variety of great wine makers. This wine is purple in color. The nose has dark cherries, dark chocolate, spice and cedar. On the palate, there is plenty of dark cherry fruit layered with brown tobacco notes. There are firm tannins that seem to grow in the glass. Despite being 11 years from vintage, this really needs time or air. There appears to be enough fruit to outlast the tannins. There is certainly more upside on this wine.